12"L wallmount hanger display arm. 1" round tubing, wallmount fitting room frame: 48" wide X 36" deep. 3"L wallmount fitting room hook. 6"L wallmount fitting room hook. 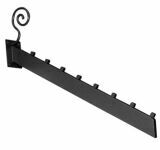 7 ball wallmount hanger display slant arm, 18"long. 17"L wallmount handbags display arm. 5 ball wallmount hanger display slant arm. 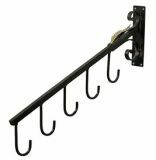 12"L wallmount hanger display arm, rectangular tubing. 9"L wallmount hanger display arm, industrial look. 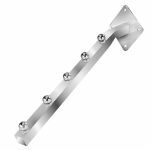 4.5"L wallmount hanger display arm, industrial look. 10"L wallmount hanger display arm, industrial look. 7 tube wallmount hanger display slant arm. 6" H X 3.5"D wallmount fitting room hook. 49"L x 12"H x 11.5"D. Wallmount hangrail for hangers, screws not included. Wallmount hanger display arm, screws not included. 8"L wallmount hanger display arm, industrial look. 16"L wallmount scarves display arm, 6 loops. Slant style 5-hook handbag holder mounts directly into the wall. Decorative stool great for fitting room. 17"H X 14"W X 14"D.
6"H X 3.5"D wallmount fitting room hook. 20"H female mannequin head wallmounts straight to the wall. 22.5"H male mannequin head wallmounts straight to the wall.